The Citrine had been on my to do list for several years before I finally got the opportunity to dive it with Pothkerris in July 2003. It's certainly a dive I'd like to repeat. heavy seas and she sank in 1956. 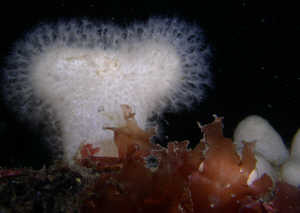 Today she lies upside down, bows to the NNE stern to the SSW, in about 18-25m adjacent to rocky reef. The location is tidal and should be dived on slack water. Mike put the shot into the bow, the only bit of her that sticks up significantly and down we went. Our decent took us to a large opening in the hull. Mike had warned us about the opening and had told us that the shifting bottom could cause it to partially close at times and that we were to be careful, sound advice! On the day we dived it the opening large and we could clearly see the other side so in we went. There was no sign of the two conger that the first pair in had seen. However, as we swam over the large fallen ladder and through the tangles of ironwork we did see a nice shoal of bib, some probably the largest I've seen. 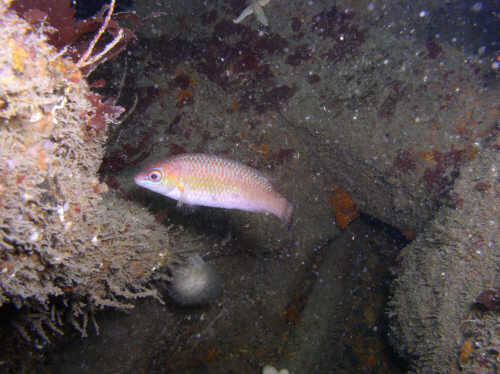 Outside the wreck were an inquisitive male cuckoo wrasse, a few sea fans and dead means fingers, neither species was as prolific as on the Manacles, but present non the less. 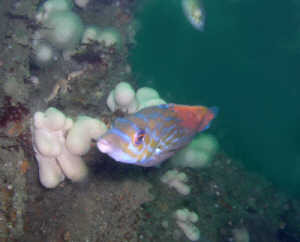 An inquisitive male cuckoo wrasse just outside the wreck. 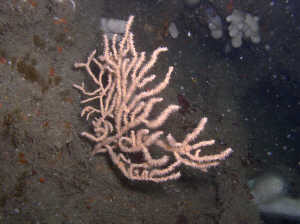 gorgonian sea fans can be found on the site, but they are not as prolific as in other areas. The midships were well flattened but with plenty of nooks and crannies for marine life to shelter in. The stern was also well compressed with fairly large spaces inside for fish but not of them penetrable. All in all a very pleasant dive well worth repeating. My thanks to Mike and all at Porthkerris divers for an excellent days diving. Caution - Tidal, slack water on neep tides only.